Ilana C. Myer has written about books for the Globe and Mail, the Los Angeles Review of Books, the Huffington Post, and Salon. Previously she was a journalist in Jerusalem. Last Song Before Night is her first novel. Click here for more stories by Ilana C. Myer. 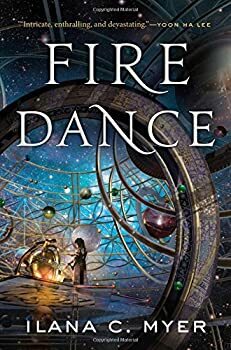 Readers who were enthralled by Ilana C. Myer’s 2015 debut novel, Last Song Before Night, will be pleased to know that they can expect more of what they enjoyed in the sequel/companion novel, Fire Dance (2018). Myer’s prose is rich and imaginative, and her worldbuilding is multi-layered. For my own part, I think that many important details wouldn’t have made sense to me if I hadn’t read Last Song Before Night first, but readers who begin these books with Fire Dance may feel otherwise. Last Song Before Night (2015) is the debut novel from Ilana C. Myer, and while many aspects of the work shine — detailed world-building combined with protagonist backstory and development — they come at the expense of antagonist development, prose ranging from lovely to overly ornate, and, most importantly, the plot of the novel itself.